The future. At least that's what Drum Corps International called it when unveiling its new project yesterday shortly after 4pm. DCI is expanding its brand to include Drumline Battle and SoundSport, two additional competitive outlets that reach beyond the standard junior drum and bugle corps for which DCI is known. Drumline Battle will invite drumlines and percussion ensembles of 30 or fewer marching percussionists (it specifically states no pit or grounded percussion) to compete, while SoundSport allows for competition of ensembles of 5 to 50 performers, regardless of instrumentation. There are no age restrictions in either. A quick glance at DCI's new endeavor. This could be an exciting new development, but frankly, the grand unveiling yesterday left me with more questions than answers. What I see immediately is that this serves as a bit of a "great compromise" that can bring more into participation with DCI activities. The lack of age limits means that participation is no longer restricted to those 22 years of age or younger; the freeform nature of both aspects may attract non-corps style marchers and musicians; and perhaps most significantly, the lack of instrumentation restrictions means that for the first time, there could be woodwinds participating under the DCI umbrella. Still, little else was revealed about how competition will take place and be judged/evaluated. The release mentions virtual competitions and live events, but I expect more will be revealed in time. There is no indication of competitive classes or divisions, which I would consider a crucial element when casting a net this wide. 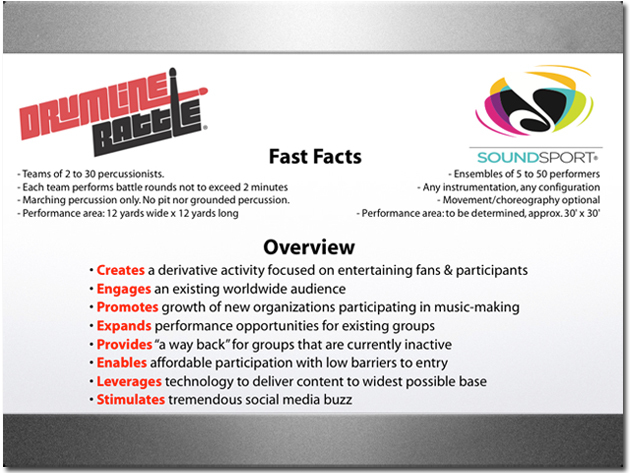 For example, under SoundSport's currently limited guidelines, a standard rock band could be competing with an emergent drum corps or an accordion ensemble. Drumline Battle could pit Santa Clara Vanguard's cymbals against a Taiko ensemble from Japan or Cold Steel from North Carolina A&T's Blue and Gold Marching Machine. While this concept intrigues me, I will also concede that few are qualified to evaluate each ensemble on a sheet that would be fair to each one's individual style. Still, some of these matchups produce what could be the most exciting about these new endeavors. Imagine a competition in the Carolinas where Carolina Crown's contras faced off against South Carolina State's Thunder Brothers sousaphone line? Or VCU's Pep Band taking on a reemergent Southwind corps? Or the Cavaliers drumline blocking up against the University of Illinois'? While I'm grading the move as an "incomplete" until there's more information - and I'm led to believe there should be at least a bit more this coming Wednesday - there were, as expected, already some vocal critics. I saw more than one person on Facebook and/or Twitter equate this to DCI's answer to WGI. Another bemoaned that corps are already compared to the movie Drumline enough (I've mentioned this rift before). I'm cautiously optimistic, but I have just a couple of concerns. The first is ensuring quality. After all, the lack of age limit has every has-been considering putting together a group right now (I know I am!) and other groups that are already formed but may not have the chops to participate in other competitions may explore this avenue. This is great for access, but if the goal is to produce high-quality virtual and live events, there has to be a threshold for participation. My second concern is that in a world where many find their entertainment dollars scarce, my fear is that this actually competes with drum corps as we know it. After all, if this provides a more accessible marching/athletic music fix, some may choose it over the traditional DCI show. Alternatively, traditional shows already being a known quantity may make it difficult for these new endeavors to thrive. Regardless, I wish DCI the best of luck in this and look forward to learning more.